Today Facebook announced its quarterly earnings for 2015 and the results are solid. 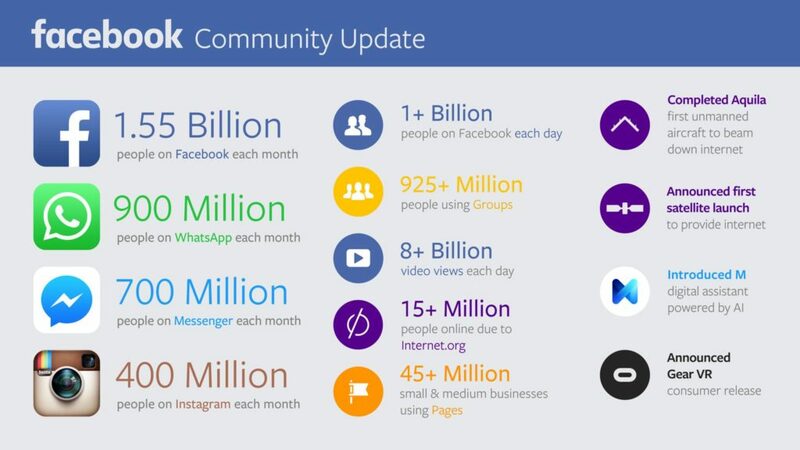 Facebook has now exceeded 1.5 billion users with 1.55 billion people on Facebook each month. This influences and continues the 1+ billion people on Facebook each day. 925+ million people are using Facebook Groups. Facebook Groups continues to be a super strong product, where many come together on interest based or social club terms. Facebook Video is now reporting 8+ billion views a day! These are great numbers in the race for Facebook to secure a solid video platform or YouTube alternative and Facebook now reports 45+ million small/medium business pages. The graphic below gives you the rest, but it’s fair to say Facebook just keeps going from strength to strength.